Want to understand how the Alliance AmeriCorps VISTA Program works and how your organization might qualify for a "capacity builder?" Do you have a need for a "grant in human capital" with a focus to start, strengthen, or expand programs and services to help your community move out of poverty? Join us for this FREE informational webinar! The Alliance AmeriCorps VISTA Program supports a network of projects serving the common goal of alleviating poverty. AmeriCorps VISTA members who are qualified to serve with the Alliance are nationally recruited, and range from recent college graduates through mid-career professionals, to retired and experienced individuals. AmeriCorps VISTA members sign up for a year-long, full time commitment to work on a specific project at a nonprofit organization or public agency serving a RURAL population. VISTA members focus their efforts on building the organizational, administrative and financial capacity of organizations that fight poverty. 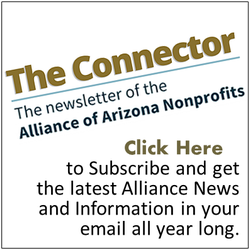 The Alliance has a lens toward organizations working on economic opportunity, health needs for economically disadvantaged individuals, opioid addiction prevention and recovery, and education in rural Arizona communities. The Alliance AmeriCorps VISTA program will serve 40 different site locations over the next 12 months. How can your organization benefit from this capacity building program?